The Anker Soundcore isn't expensive, but it's worth every penny. For under $50, you'd be hard-pressed to find a better sounding speaker. 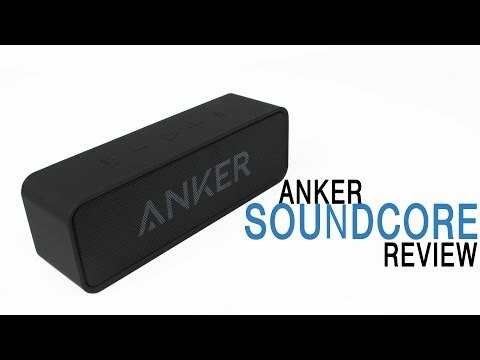 Anker kept things very simple with the Soundcore. Similar to the design of the speaker (more on that later), the unboxing is straightforward and minimal. In the box you’ll get the speaker, a smaller box with a micro USB charging cable, and the warranty information. There’s even a clever little booklet with instructions on how to go about letting Anker know what you think about the product. The speaker isn’t flashy or over, and has a minimal design that can easily be overlooked in a line-up of other speakers. That said, it isn’t ugly. The Soundcore is a small black rectangle made of soft plastic all the way around, save for the front of the speaker which is covered in a grille. The grille has the Anker name on it in white and is one of two places where you’ll find branding on this speaker, the other on the back. The soft plastic isn’t exactly a fingerprint magnet but you’ll definitely want to wipe it down every once in a while if you want to maintain that “fresh out the box” look. I’m not a big fan of a company sticking their name on every inch of their products but Anker does it in a simple way that doesn’t take away from the overall aesthetic of the speaker. In a way, it’s almost adds to the design of the speaker and helps to differentiate it from the other small rectangles in this category. The buttons up top blend into the smooth plastic and decent but could use some extra click. The only real issue I had with the design was the small LED light on the front of the speaker. It flashes blue when pairing, remains blue when connected, and changes to red when the battery is low. That said, it is slightly off center because of the driver placement on the inside of the grille and even though that might not be a big deal for most people it irked me every time I looked at it. Still, besides that I enjoy the minimal design overall. It’s clear that Anker wanted to keep a low key design that wouldn’t draw too much attention if you have it on your desk or a table. The speaker feels solid enough, but if you were looking for something durable this probably won’t survive more than a few drops. Connectivity was a little above average for speakers in the price. It has Bluetooth 4.0 and a range of about 60 feet which worked fine for the most part. Once you get to the fringes of about 40 feet it does begin to stutter and skip if there are walls, but if there aren’t any then the connection holds strong. The buttons on top also work great. You can pause or play music and control volume right from the device. On the side of the speaker is also an AUX input for anyone who uses a source device that isn’t Bluetooth compatible. Battery life for the Soundcore is spectacular, and that’s not an exaggeration. Anker claims that it can give you up to 24 hours of constant playback and in all of my testing, which includes bursts of listening for a few hours a day, I haven’t been able to kill it yet. If you don’t want to worry about charging your device at all, this is the one to get. Using Spotify with the streaming quality set to ‘extreme’ and a few files from my own computer, we mainly tested the quality wirelessly since that’s how most people will probably use this speaker. In terms of volume, the lows were pretty much what you would expect from a speaker of this size. That said I was not expecting how clean the low end would be. Normally when a small speaker tries to push bass it ends up sounding fake or muddy, but Anker did a good job at maintaining quality in the low end. The deep bass kicks in ‘Trouble’ by TV on the Radio were displayed nicely and it doesn’t feel like you’re missing out on any of the song. Mids were nice and smooth and the only time I heard something a little off was in ‘Man in the Night’ by Kid Cudi when some of the heavier guitar didn’t get lost, but definitely lost some of their crunch and detail. Besides that vocals and acoustic guitars were fine. The high end in the Soundcore definitely had some harshness at max volume but only a little. The percussion elements in ‘River’ by Leon Bridges were slightly piercing but, like a lot of speakers, lowering the volume one or to clicks basically solves this issue. All of the SoundCore controls sit atop the soft-touch speaker. Out of the box includes the Anker SoundCore Bluetooth speaker, Micro-USB charging cable, welcome guide, and 18-month warranty. Dual high-performance drivers and a unique spiral bass port deliver great sound quality with the Anker SoundCore. For less than $25, the Anker SoundCore provides 24 hours of playback time. The Anker Soundcore is without a doubt one of the best speakers you can get if your upper limit is $50. The sound-to-size ratio is great and it has the sound quality of a speaker twice its size. That said it doesn’t get s loud as that hypothetical speaker, but it gets loud enough that if you’re having a dinner party it should be sufficient. If you’re in the market for good quality at a decent price, this is the way to go. 24 hours of constant playback is a bold claim to make and Anker delivers on that promise without sacrificing what makes their products so good: good quality and good prices.